Posted 11:10 pm by Administrator & filed under News. Following the successful debut of HPA’s first project in Oregon — the Hub on Campus Eugene student residence — the firm is embarking on its second commission with developer Core Spaces in the Pacific Northwest. Construction is underway on the Collective on 4th, a 488,000 SF mixed-use building in downtown Portland. 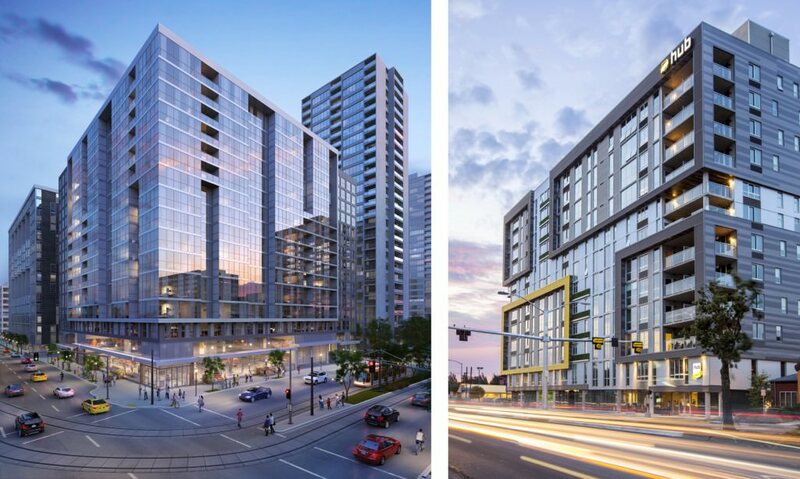 Located at the corner of Southwest Fourth Avenue and Harrison Street near Portland State University, the development will include 417 market-rate apartments and 32,000 SF of retail space. Rising 15 stories, the tower will offer views of the Willamette River and Cascade mountains. With a variety of unit layouts, including studios, one- and two-bedroom apartments, as well as duplex townhomes with terraces, Collective on 4th is designed to appeal to a mix of young professionals, families and empty nesters. With more than 6,000 SF of common outdoor space overlooking adjacent Pettygrove Park, residents can access bocce ball courts, an oversized hot tub, dog run, and lounge seating. Indoor amenities include a state-of-the-art fitness center, spa and sauna, business center, and exhibition kitchen. The project team includes HPA, consultants KPFF and Lango Hansen Landscape Architects, and contractor John Hyland Construction. Delivery is expected in Fall 2018. HPA recently completed Hub on Campus Eugene, a luxury student-housing development in downtown Eugene, Oregon. Collaborating with Core Spaces, the project was conceived as a pioneer in catalyzing urban development of downtown Eugene. One of the city’s tallest structures, the 12-story tower features an iconic façade of cube-like forms punctuated by a single cube boldly framed in the University of Oregon’s signature yellow hue. Hub on Campus Eugene offers 183 fully-furnished units with 513 beds, and expansive amenity spaces that reflect an urban, community-centered living experience. A 10,000 SF outdoor rooftop amenity deck features a resort-style swimming pool and hot tub, jumbo videoscreens, a sand volleyball court, fire pit and outdoor seating. Additional amenities include a double-height club room with game tables; an interior courtyard with a fire pit and hot tub; a fitness center and golf simulator; spa with sauna, steam room and tanning beds; computer lab; private study rooms; and bicycle storage. Hub at Eugene earned a LEED Silver rating, and was thoughtfully designed to minimize its environmental impact and provide a healthy environment for residents.